Gross Weight (GVWR) 16600 lbs. Go off on an adventure with the 2019 Keystone Montana 3791RD! At Lakeshore RV Center, we offer the nation's lowest prices on Keystone RVs and all other 5th Wheel RVs! Come down to 4500 E Apple Ave Muskegon Michigan 49442 to see why we're the #1 Michigan RV Dealer! If you have any questions, call us at 231-788-2040 to talk to one of our RV experts today! Towing is easier with a hitch weight of 2620 lbs. and a dry weight of 13905 lbs. This rig has a GVWR of 16600 lbs. and is 40' 5" long. Stay cool in the shade of the 17' 0" awning! This 2019 5th Wheel lets you travel far without running into any unexpected problems! 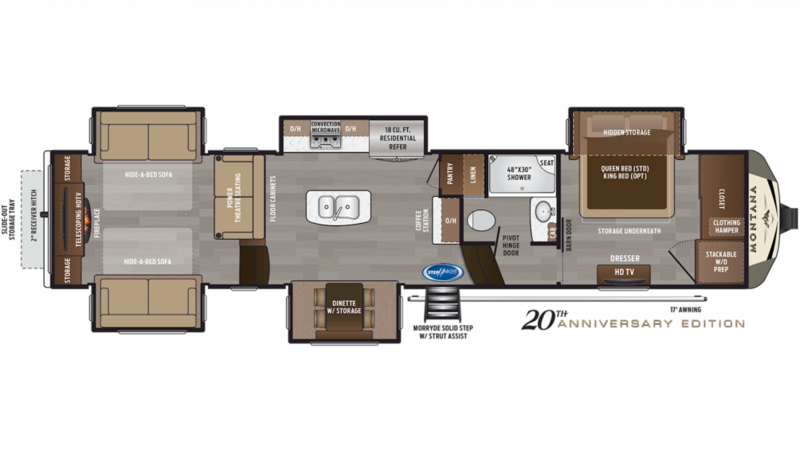 You'll enjoy plenty of living space in this 40' 5" long, 8' 0" wide 5th Wheel. The 5 slides add even more space in this Montana. No worries about bumping your head, either, with a headroom height of 13' 4"! Lounge on the comfortable Hide-A-Bed sofa or at the Free-Standing dinette! When it's hot outside, you'll be cool inside thanks to the 15000 BTU a/c unit. And the 35000 BTU furnace will keep you warm and cozy when it's cold outdoors! Up to 6 people can sleep comfortably inside this RV! Extra cozy furniture is found throughout this 5th Wheel, enough for up to 6 people to sleep. Whether you're napping in your private bedroom or just lounging around, relaxation comes naturally. Rest easy in the master bedroom's Queen bed! With the kitchen, you can whip up your favorite dishes no matter where you are in the world! There are a wealth of amenities that make cooking simple and easy, including the 18.00 cu. ft. refrigerator, 3 burner range cooktop, and more! With the 66 gallon freshwater tank, there will be plenty of water for the entire trip! This 5th Wheel has all the bathroom conveniences, thanks to its 88 gallon gray water tank and 49 gallon black water tank. Never worry about having enough hot water with 60 lbs. of LP tank capacity. Plenty to save you from making trips to the campground's communal bathroom! The RV bathroom also has a sink vanity, shower, and a Porcelain Foot Flush toilet! The fireplace will warm the interior and warm your heart with its elegant design and flickering flames!